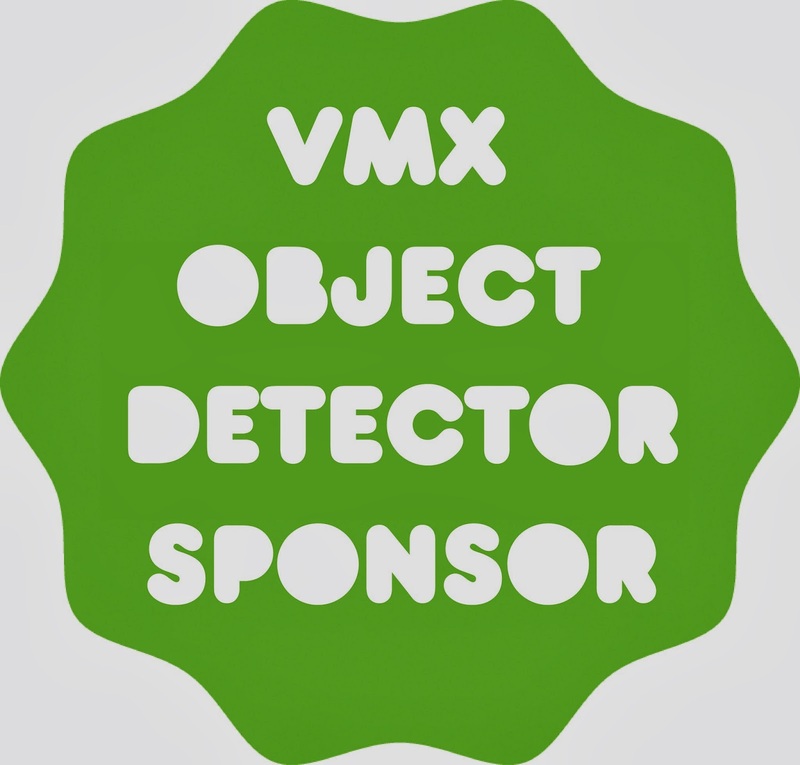 Many of you asked if the VMX Project will come with an initial set of object detectors. Yes! VMX will come equipped with a library of pre-trained object detectors. We are committed to providing you with an amazing VMX computer vision experience and want to give you as much as possible when you start using VMX. We have 100 slots for the $300 “sponsor an object detector reward,” and the name of the backer sponsoring the an object detector will appear as you mouseover the object model in the model library. This way, your name will be inside the VMX webapp model library, in addition to the wall of backers on our company page. You will be able to choose your name, your best friend’s name, your twitter handle (such as @quantombone), or your nickname. Sorry, no profanity allowed. We will release the list of 100 object detectors which will come with VMX at the end of January. Sponsors will get the chance to choose their object detectors on a first-come-first-serve basis. If you are the first one to become a sponsor, you will get to choose “face,” “car,” “guitar” or whatever other object you might be excited about! As always, you can change your pledge level and reward. So act now and don’t forget that by sponsoring an object detector you are supporting our dream project come to life! And for those of you interested in seeing more VMX action shots, here's a new video showing off VMX detecting smiles. This one was taken with Tom's iPhone because the screencapture software on his computer slows everything down. No post-processing, this is as fast as the prototype runs. Enjoy! We’re happy to announce a new reward in our Kickstarter project, one designed for free access of our robotic vision technology to high school students. If we reach our Kickstarter campaign milestone of $100K, we will give 10% of Kickstarter generated funds to high school students and clubs in the form of software licenses. $100K raised will translate to 100 single-machine VMX licenses given out to 100 different high schools and clubs during the Summer of 2014, free of charge. Optionally, qualifying high schools can choose to claim 100 VMX Compute hours if they have a problem with local performance, don’t have access to a Linux machine, and/or their security policy doesn’t allow virtual machines. Our Kickstarter project, the VMX Project, is an easy-to-use and fully trainable computer vision programming environment. With VMX, you can teach your computer to recognize objects using the webcam. We’ve already surpassed the 30% funding milestone and generated lots of great ideas from our community. Ideas ranging from medical disease diagnosis and 3D object reconstruction to smart wine inventory management. By bringing a computer vision app-building environment to students, we’re excited about the prospect of giving teens a sandbox for innovation -- an ecosystem to achieve their own technology-oriented Eureka moments. So whether a student decides to study computer science in college or comes up with the next great startup idea, we want to give them a headache-free entry to the world of computer vision. The VMX High School Program is designed to give a limited number of students and student clubs free access to VMX in-browser object recognition technology. We understand that “Computer Vision for Everyone” needs to include a broader range of individuals, individuals with little or no spending income. We’re committed to letting those who can be most influenced by new technology, the young innovators inside our classrooms, get access to our technology. By supporting our Kickstarter campaign, you are backing our vision of bringing computer vision technology to the masses. So whether you want VMX for your own creative use or want to give something to your community, we hope you’ll appreciate our new VMX Project High School Program reward and back our project. In addition, backers of our project will be able to donate any of their unused Compute Hours into the Eureka fund so that additional high school students get access to our technology. If you are a high school student or high school teacher and would like get some cool computer vision technology for your school, please send an email to “admin@vision.ai” with “VMX Project High School Program” in the title, briefly describing what you’d like to do with VMX, your age, and school name. To generate interest among your students and friends, share our VMX Kickstarter video with your classroom and have one of your students email us with their idea. Kickstarter is all-or-nothing, so we need to reach the $100K funding milestone to make this project a reality. We are excited that as software developers, our creations have the potential to spread rapidly. But we want to make sure that one of valuable demographics, creative high school students, isn’t left-behind. 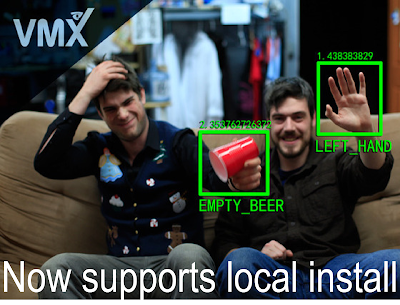 Help spread the word about VMX using social networking and let’s make 2014 the year of new technology by bringing computer vision technology to the masses. It's a valid question: can a person-specific face recognition algorithm be used to determine a person's race? I trained two separate person-specific face detectors. For each detector I used videos of the target person's face to generate positive examples and faces from [google image search for "faces"] as negative examples. This is a fairly straightforward machine learning problem: find a decision boundary between the positive examples and the negative examples. I used the VMX Project recognition algorithm which learns from videos with minimal human supervision. In both cases, I used the VMX webapp for training (training each detector took about ~20 minutes from scratch). In fact, I didn't even have to touch the command line. Since videos were used an input, what I created are essentially full-blown sliding window detectors, meaning that they scan an entire image and can even find small faces. 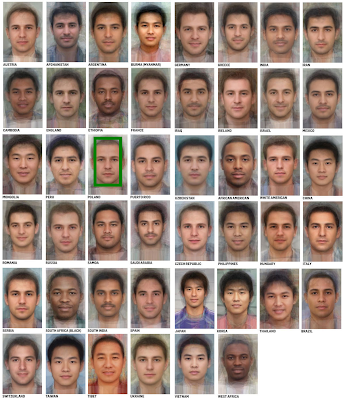 I then ran this detector on the large average male face image. This average face image has been around the internet for a while now and it was created by averaging people's faces. By running the algorithm on this one image, it analyzed all of the faces contained inside and I was able to see which country returned the highest scoring detection! For the first experiment, I used a video of my own face. Because I was using a live video stream, I was able to move my face around so that the algorithm saw lots of different viewing conditions. Here is a the output. Notice the green box around "Poland." Pretty good guess, especially since I moved from Poland to the US when I was 8. Here is a 5 min video (VMX screencapture) of me running the "Tomasz" (that's my name in case you don't know) detector as I fly around the average male image. You can see the scores on lots of different races. High scoring detections are almost always on geographically relevant races. For the second target, I used a few videos of Andrew Ng to get positives. For those of you who don't know, Andrew Ng is a machine learning researcher, entrepreneur, professor at Stanford, and MOOC visionary. Here is the result. Notice the green box around "Japan." Very reasonable answer -- especially since I didn't give the algorithm an extra Asian faces for negatives. Here is a 5 min video (VMX screencapture) of me running the "Andrew Ng" detector as I fly around the average male image. In conclusion, person-specific face detectors from VMX can be used to help determine a person's race. At least the two VMX face detectors I trained behaved as expected. This is far from a full-out study, but I only had the chance to try out on two subjects and wanted to share what I found. The underlying algorithm inside VMX is a non-parametric exemplar-based model. During training the algorithm uses ideas from max-margin learning to create a separator between the positives and negatives. If you've been following up on my computer vision research projects, you should have a good idea of how these things work. 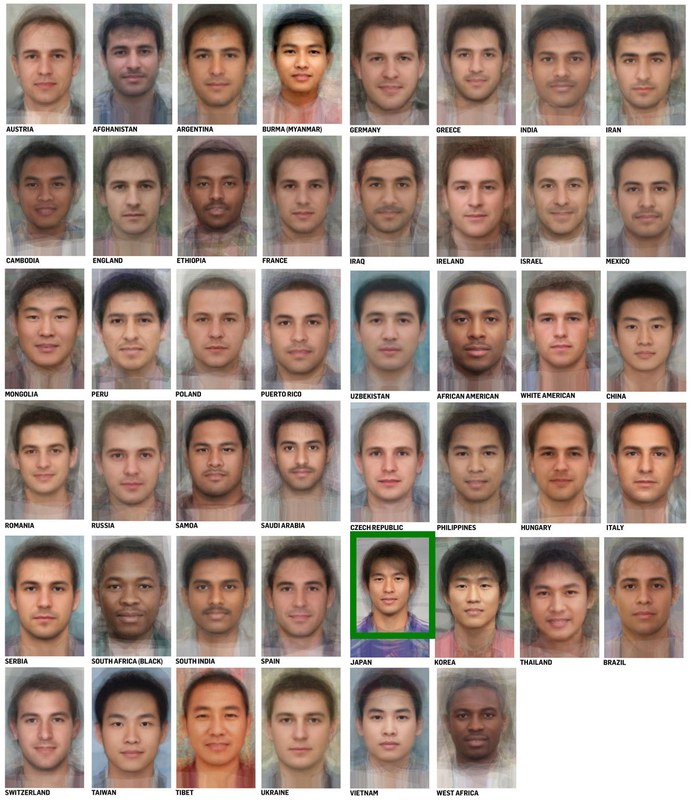 I want to mention that while I showcase VMX being used for face detection, there is nothing face-specific inside the algorithm. The same representation is used for bottles, cars, hands, mouths, etc. VMX is a general purpose object recognition ecosystem and we're excited to finally be releasing this technology to the world. There are lots of cool applications of VMX detectors. What app will you build? To learn more about VMX and get-in on the action, simply checkout the VMX Kickstarter project and back our campaign. We use the JSFeat library to track points inside the video stream. Below is a YouTube video of our webapp in action, where we enabled the "debug display" to show you what is happening to tracked points behind the scenes. The blue points are being tracked inside the browser, the green box is the output of our object detection service (already trained on my face), and the black box is the interpolated result which integrates the backend service and the frontend tracker. The tracker calculates an optical flow for a sparse feature set using the iterative Lucas-Kanade method with pyramids. The algorithm basically looks at two consecutive video frames and determines how points move by using a straightforward least-squares optimization method. The Lucas-Kanade algorithm is a classic in the computer vision community -- to learn more see the Lucas-Kanade Wikipedia page or take a graduate level computer vision course. Alternatively, if you find me on the street and ask nicely, I might give you an impromptu lecture on optical flow. Instead of using interest points, in our prototype video we used a regularly spaced grid of points covering the entire video stream. This grid gets re-initialized every N seconds. It avoids the extra expense of finding interest points inside every frame. NOTE: inside our vision.ai computer vision lab, we are incessantly experimenting with better ways of integrating point tracks with strong object detector results. What you're seeing is just an early snapshot of the technology in action. To play with a Lucas-Kanade tracker, take a look at the JSFeat demo page which runs a point tracker directly inside your browser. You'll have to click on points, one at a time. You'll need Google Chrome or Firefox (just like our VMX project), and this will give you a good sense of what using VMX is going to be like once it is available. Try the JSFeat Optical Flow Demo! To summarize, there are lots of great computer vision tools out there, but none of these tools can give you a comprehensive object recognition system which requires little-to-none programming experience. There is a lot of work needed to put together appropriate machine learning algorithms, object detection libraries, web services, trackers, video codecs, etc. Luckily, the team at vision.ai loves both code and machine learning. In addition, having spent the last 10 years of my life working as a research in Computer Vision doesn't hurt. Getting a PhD in Computer Vision and learning how all of these technologies work is a truly amazing experience. I encourage many students to undertake this 6+ year journey and learn all about computer vision. But I know the PhD path is not for everybody. That's why we've built VMX. So the rest of you can enjoy the power of industrial-grade computer vision algorithms and the ease of intuitive web-based interfaces, without the expertise needed to piece together many different technologies. The number of applications of computer vision tech is astounding and it is a shame that such technology hasn't been delivered with such a lower barrier-to-entry earlier. With VMX, we're excited that the world is going to experience visual object recognition the way it was meant to be experienced. But for that to happen, we still need your support. Check out our VMX Project on Kickstarter (the page has lots of additional VMX in action videos), and help spread the word. You asked, we listened. VMX will be available to run locally. The following post is a result of my team launching a Kickstarter campaign two weeks ago and upgrading one of our rewards based on all the feedback we received from backers and potential backers. We initially intended to launch the VMX project as a service meaning that it would only run over an internet connection to our serves. But there were scenarios where this was not appropriate. Some people didn't have a fast enough internet connection at home, some people were worried that it would be too expensive to use our product, and some people couldn't use software which required an internet connection at work. The VMX Project, our flagship computer vision in-the-browser software, will not run using a local object detection server. Over the last few weeks, we've listened to many backers (and potential backers) talk about our technology and would like to thank everyone who gave us valuable feedback. Many of you didn’t like VMX being offered only as a service (requiring an internet connection), so we decided to offer a local VMX installation in addition to making VMX available as a service. We didn’t anticipate such great demand for VMX running locally on people’s own computers and networks, but we are dedicated to letting developers have an exceptional computer vision experience and are eager to give our users what they want. We hope this will make all VMX users more excited about our technology. Two seconds left. You can feel your quads burning. 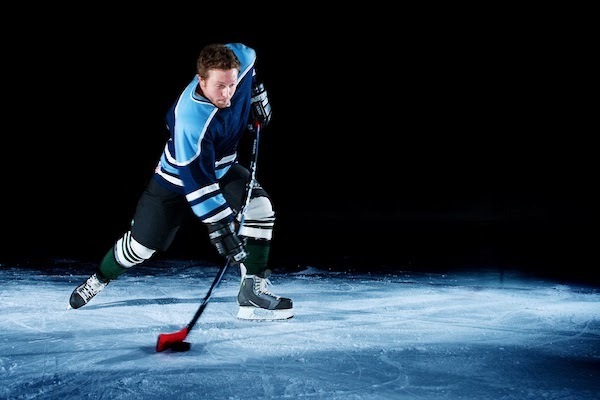 Your form on the ice is rock solid. As you race past the last defender, the only thing standing between you and the win is the goalie who you’ve beaten one-on-one countless times. You’ve been practicing for this moment your entire life. Getting burned on your way to victory is precisely what happens when you try to execute a business plan devised inside your company walls. 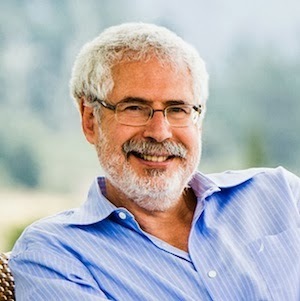 As Steve Blank would say, “No business plan ever survives first contact with the customer.” When Steve Blank, author of “The Startup Owner's Manual,” the genius behind the Customer Development process, and entrepreneurship professor at Stanford, gives you a message, he means business. You better write this one down. Today’s post is dedicated to his iconic message, “Get out of the building.” Your initial goal as an startup founder is not to execute a business plan. Thinking you can build it, and then they will come, is thinking inside the building. You have to go into the world, meet potential customers, talk to them, and learn from these interactions. This is precisely what getting out of the building means. You have to search for a business model. If you plan on scoring without pivots, you are likely planning to fail. According to Steve Blank, a startup is a temporary organization whose goal is to search for a scalable business plan. And the magic can only happen when you go outside your comfort zone, when you talk to people. This is exceptionally difficult for technical founders to grasp. Dear technical masterminds with an itch for entrepreneurship: “getting out of the building” is the single most important piece of advice taken from all of Steve Blank’s writings. Years of training, building things, and being on the forefront of technology have likely given you a skewed perspective on what the world wants. To become a successful entrepreneur, you must first undo the damage of over-education. Once you learn how the world thinks, your technical talent won’t go away, and you’ll be in a great position to lead a great company. I wrote this blog post for a few reasons. Foremost, as a first-time startup founder, I've been reading endless books on the subject and writing helps me remember what I learned. I guess this blog is now about computer vision and entrepreneurship. Secondly, this post serves as a note-to-self because I've been guilty of engineering products to death and skipping customer development altogether (as you'd expect from a Robotics PhD). Steve Blank’s book “Four Steps to the Epiphany,” which is the most influential book I read in the past 10 years. As groundbreaking as Kuhn's “The Structure of Scientific Revolutions” was to science, Blank's "Epiphany" will likely go down in history as the one that changed the course of entrepreneurship. P.S. Another great book I just finished reading, Made to Stick, contains a similar point referred to as “The Curse of Knowledge.” The curse of knowledge happens when your message fails to get across because you assumed everybody else is a knowledgeable as you. Or as Steve Blank would say -- you built a feature-rich product flaunting the benefits of advanced features without understanding that the world isn't filled with technical experts. Nobody cares about your features. Not yet. Get out of the building.